The first thing you need to do is consider the space available in your spa. Your establishment might get very busy at times and you’ll want to maintain a good flow of movement in the spa. 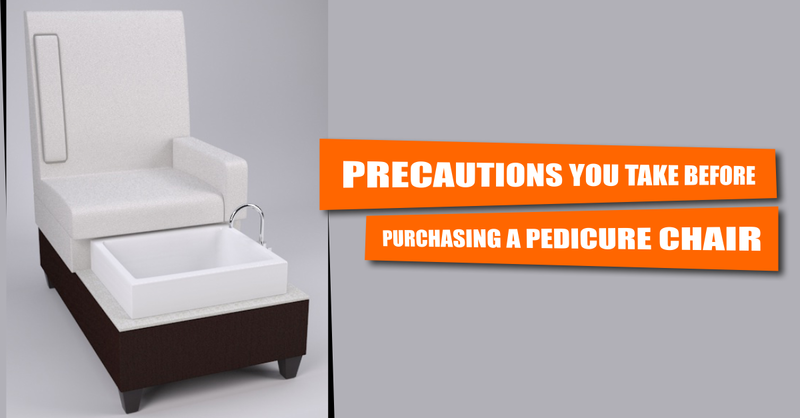 If pedicure chairs disrupt that flow of movement and take up space you don’t have, it wouldn’t do your spa any favors. It’s always a good idea to look at the floor plan of your spa and decide just where you can place the spa chair without disrupting the flow of movement. You might want to consider a bit of a redesign to accommodate not one, but two or more pedicure chairs in your establishment. That’s the only way you might see any real return on investment. One of the most important aspects you need to consider when you’re adding spa chairs to your establishment is the money. Pedicure chairs are a great investment and as we mentioned above, you need a couple of them to see real return on it. However, they can be expensive, especially if you want to purchase a chair that’s of good quality. Before you plan to purchase a new chair, consider your financial position and whether you can afford a chair comfortably enough. If you find that you can, it’s time to move on to the next point. Products from these companies are usually considered the best in the market. It would serve you well to check out their product line. After you’ve narrowed down the chairs that suit your needs and meet your budget, the next step would be to get to know a little more about them. You can do that by asking your fellow spa owners. You can also go to other spas for a pedicure and experience the chairs yourself. Experiencing the chairs personally would allow you to feel just how comfortable they would be for your clients. That would ensure that you make the right choice for your spa. We mentioned customer service before and we can’t stress just how important it is. When your income depends on the proper functioning of spa chairs, it’s vital to get them repaired quickly if something goes wrong. If you choose the wrong manufacturer that doesn’t offer good customer service, you’ll face several days of lost revenue. However, if you choose a manufacturer that responds quickly and repairs the problem as soon as possible, you’ll face minimal downtime. In the spa business, it’s important to keep your equipment running well at all times. Good customer service will help you with that. Along with good customer service, you should also choose a manufacturer that offers good warranty on pedicure chairs as well. A warranty would mitigate some of the expenses that come along with spa chair repairs. It’s always a good idea to purchase a chair that comes with good warranty coverage. If you have any questions about pedicure chairs and equipment, you’re free to contact us at Pedi Source. Just give us a call at 1855 429 PEDI. You can also email one of these two email address with your questions and contact details: [email protected] and [email protected].